A what? Yes, I know. I had never heard of it myself either. It is one of those awards that is meant to make you feel good and encourage small blogs (less than 200 followers). It is a great way to spread the love around the blogging community and remind ourselves how great it is to read each other's blogs. 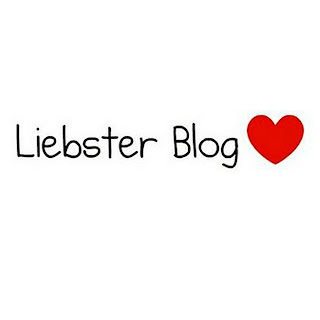 Hey I love the new site and - eek - if you changed it ages ago, forgive me as I've been out of the loop and well behind on following my favorite bloggers.So I am coming out of my hybernation to say I enjoy your blog so much I am nominating you for a Liebster award. I was sick that week and it made me feel better (albeit very briefly). Just when you think noone is reading your blog, you discover that someone whose blog you like reading also reads yours! Thanks Cordelia. Then a week later, I got another message from Tamara nominating me a second time! I kid you not! Woah! Many thanks Ladies! When you receive the award, you post 11 random facts about yourself. I used to play the flute (western concert flute) when I was a child/teenager. I was pretty good at it. I played in a kid's orchestra for quite a long time. I am not sure I would still be able to play it as well now. I hate dogs. They scare me. I had a very bad experience when I was a child and it traumatised me. Seriously! I try to be rational about it but it is beyond me. I LOVE chocolate. I would eat it for breakfast, lunch and dinner if my husband let me. It is the best thing to cheer you up too. I always dreamt of having a multilingual family and am so grateful and happy that it came true. It is a lot harder work than I ever imagined but I think it is all worth it. I hated German lessons at school. I much preferred English. But I did learn German for over 6 years! Ok, I have admitted it. And now, I live in Germany and very little remains. How sad!! Our daughter wore cloth nappies/diapers for the first 2 years of her life. So many people told us we would never manage and would give up. It was really fun and not at all difficult. I very rarely drink alcohol. I don't really enjoy it and I hate what it does to people who abuse it. I love travelling. If money and jobs were no object, I would travel the world for ever (I think). My dad started teaching me English at home when I was young (before learning it at school) at my request, apprently. I like swimming and cycling (sometimes). If you don't mind, I will answer half of Cordelia and half of Tamara's questions. Otherwise, you will get bored reading! Le petit fute guide to Lanzarote! Our next holiday destination. Where would you live and why? I would live anywhere. I love our displaced set up and am prepared to move anywhere in the world. What is the one piece of advice you would give your teenage self if you could? Ninja! It is our daughter's favourite word at the moment even though she has no idea what they are. A lot of things: from a good movie to a great hug. I am quite emotional. My multilingual toddler. She is amazing. She can drive me nuts, yet I can't stop loving her. Jeans everyday. I live in them. Getting things wrong. I am quite shy and always like to get things right and not make a fool of myself. What excites you about life? The unexpected. The fact that you never know where you might be in a year's time. Who knew I would live in Germany?! If you could sit next to anyone on a plane for 10 hours, who would it be? Nobody. Ah, the silence and comfort of having the seats to myself! Bliss! What are you experiencing in your body, right now? Hunger. I am hungry. Off to grab some chocolate! To the 10* blogs mentioned below: I read you on a regular basis and love them. Please feel free to ignore this award, but rest assured that you have at least one fan out there. In some cases, I wasn't sure how many followers they had but I picked some where the audience was not obviously enormous. Do you like your first name? What language do you wish you knew? Why? What is your favourite travel memory? Are you good at handcrafting? What is your opinion on singing karaoke? Well done, if you have made it this far! Now, go and read the blogs above.